Yesterday, not much special happened. Philippe and I both used the spare time in the morning to work on some things that we did have time for to do whilst on the road. The afternoon we spent waiting at the airport and the evening predominantly in a taxi, Evening traffic was, well, let’s say, dense. It took us more almost 3 hours to travel the 20 or so kilometers that lie between the airport and our hotel near the CIP. Today was definitely way more exciting. 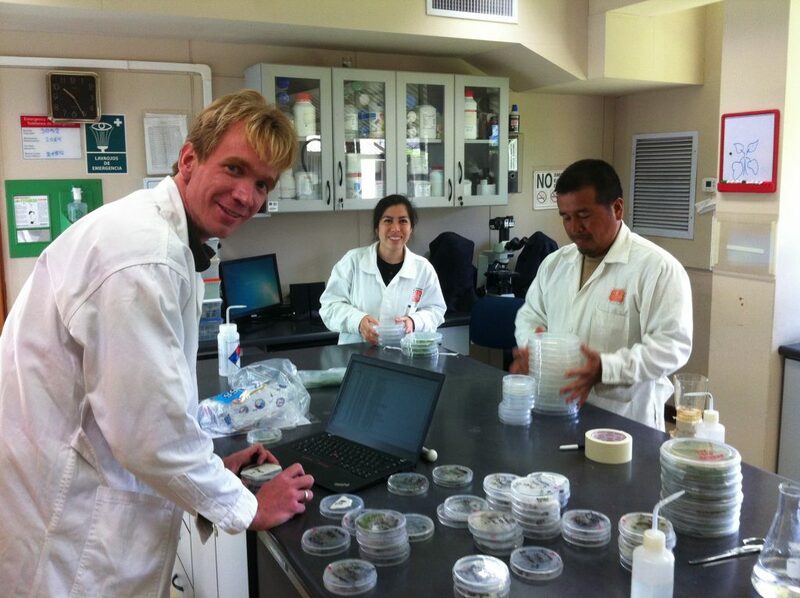 When Philippe went his way to check on his possible Ralstonia strains, I went to the Phytopthora lab to get updated. As with any research project and probably even more with these kind of exploring projects there was good and bad news. Philippe had quite a meager score, only six or seven isolated bacteria from the samples. However, this makes sense in many ways. Many stem samples were quite dry and the plants were not wilted, so the bacteria are probably not very heavily present. It could also be that the methods used were not effective enough to extract the bacteria from the sometimes even woody sample and lastly it could very well be that these particular Ralstonia strains are viable but not culturable or maybe they are culturable, but on slightly different medium than the known Ralstonia from cultivated tomato. DNA test will now have to prove if and how many plants really contained Ralstonia and what these isolated samples exactly are. Pretty exciting! I have learned that the isolation method with the sliced potatoes (which works well in the lab for Phytophthora strains from potato), does not seem to work at all. Nothing grew. This could be the way the potatoes had been handled and stored on our route. But, we cannot bring 18 degrees high humidity incubators during the trip, so unless some very different results come from this weeks samples, we don’t have to use this method again. Somehow that’s a shame, because carrying petri dishes around is way more hassle and also way more prone to contamination. One day last week, I had to throw half the petri dishes out, because they were contaminated during our travels. That meant that day, I could only use the potato method to store samples. Then again, P. infestans grows slow and there is still a chance that some mycelium appears on the tubers. But, I guess this is already a lesson learned: Bring more and cleaner petri dishes! On the other hand, the technicians had seen actually numerous good looking symptoms on quite a lot of the leaves that we collected the beginning of last week. The bad news was that even though the symptoms were there, is was very hard for them to recover live Phytophthora from the leaves, because they were so dry. I think this is partly due to the used methods,which differ a lot from the methods we use in the lab. Here they wait for the leave to spontaneously sporulate and wash off the spores and sporangia and then look for them in the washed off watetr. This is highly diluted and often contaminated with other sores, so it’s not an easy task. In Freising we would force Phytophthora to grow directly on a plate with rich medium and only later we worry about how to get the isolate clean. This is something that I should have checked beforehand. These are not cultivated potatoes, so we might have fewer spores to start with and even with potato, they apparently have problems here every now and again, especially when it has been very dry. And it has been dryer than it should have been at this time of year. Later in the day,I had a look at the some of the samples from the second half of last week and I’ve seen Phytophthora sporangia washed of from both S. pennelli and S. peruvianum. The samples from this week we only just brought in, so nothing can be said about them yet, so it’s looking quite well at in the end. But the fact that so many samples from the first few days were negative, didn’t feel well to me. In my mind, rescuing Phytopthora from a leave shouldn’t be so hard and the symptoms were evident, so I was not really prepared to use molecular detection methods. Luckily, a few days ago, I came across a paper with a brand new DNA extraction method. This seemed like a good excuse to test this method and use molecular methods to detect the presence of Phytophthora in the leaves. We tried the method on 24 samples, including mycelium freshly scraped from a potato. By Monday we should have the results. 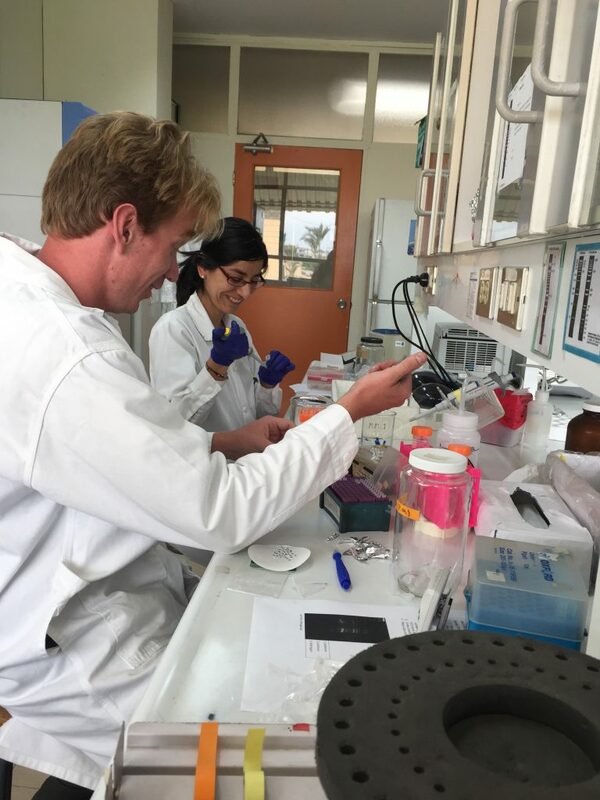 If the results are negative, there are several other methods that we still can test and there is a whole batch of samples that have yet to be processed and I will also be bringing FTA samples with me to Germany. To me, this trip was definitely a success. I have seen sporangia directly coming of samples from two different tomato species and sporangia from a third third species were prepared by the technicians and almost half of the samples are still waiting to be processed. The molecular results will tell us how much we might have missed. To be fully prepared for the next trips I will compare both isolation methods one on one when I’m back in Freising. I also have to work a bit on my route planning. Being almost without petrol or underestimating the driving time by about 4 hours are not very clever, but easy to solve! I am fairly sure that most readers of this blog are predominantly here to look at the pictures of the tomatoes. So, I will not post any more updates on the results. If you are interested to hear more of my experiences and the outcomes, please do get in touch via email. 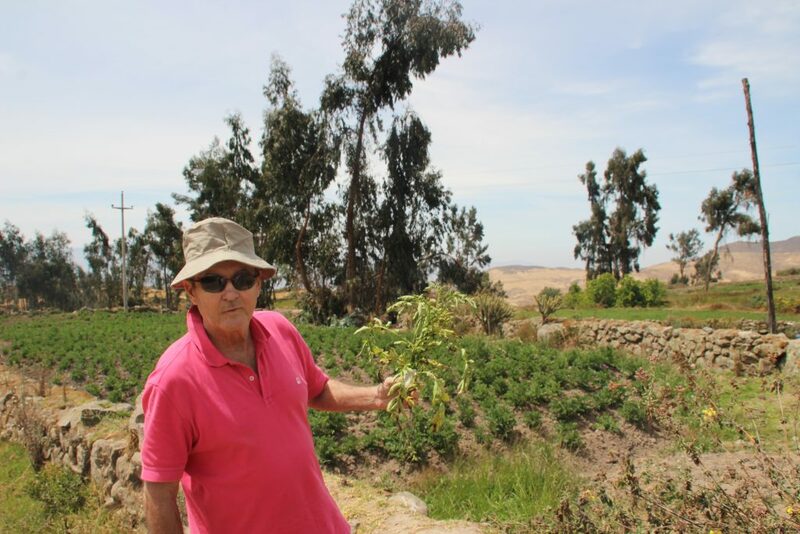 If you want to see more pictures, I invite you to check this website again some time from February next year, when Philippe and I will go to the north of Peru to look for a few other tomato species in slightly wetter climates. Gracias por leer mi blog y hasta la próxima! We decided to go to the coast today. The last two days we collected many S. chilense samples and even though this species is probably the most interesting to me, this is an exploratory trip. 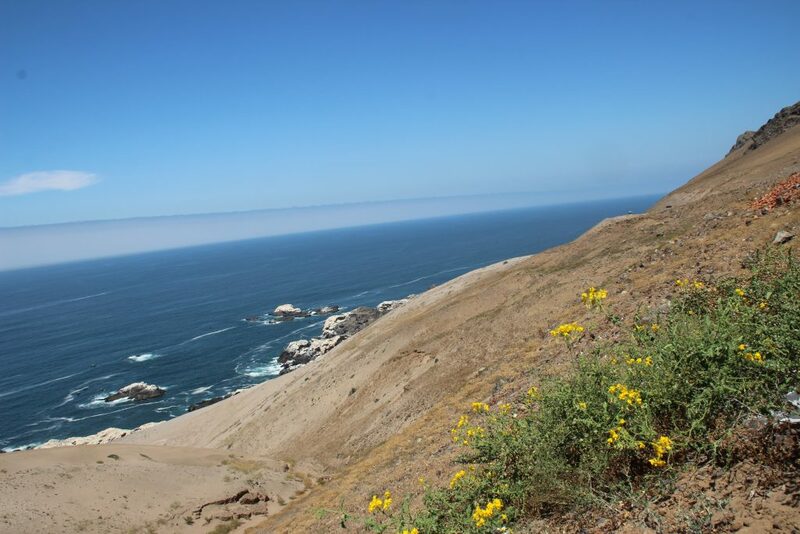 So, exploring the coast for either S. chilense or S. peruvianum would make sense to do. One extra day would not have suddenly made our S chilense collection from the mountains complete and the coastal habitats are very interesting. I will just have to come back for exhaustive S. chilense sampling. So after breakfast we got in the car, set for a one hour ride to some probable sites. 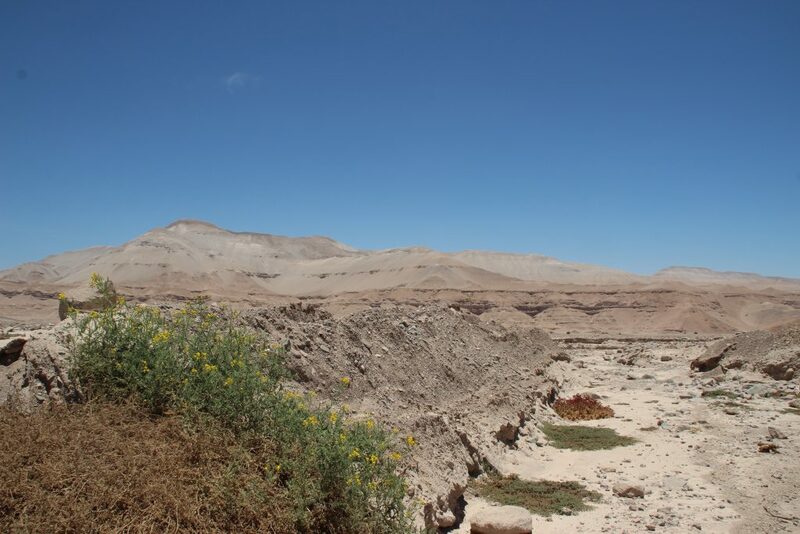 There is only one recorded sighting for S. peruvianum on the coast near Tacna and no S. chilense, so it was going to be a gamble. 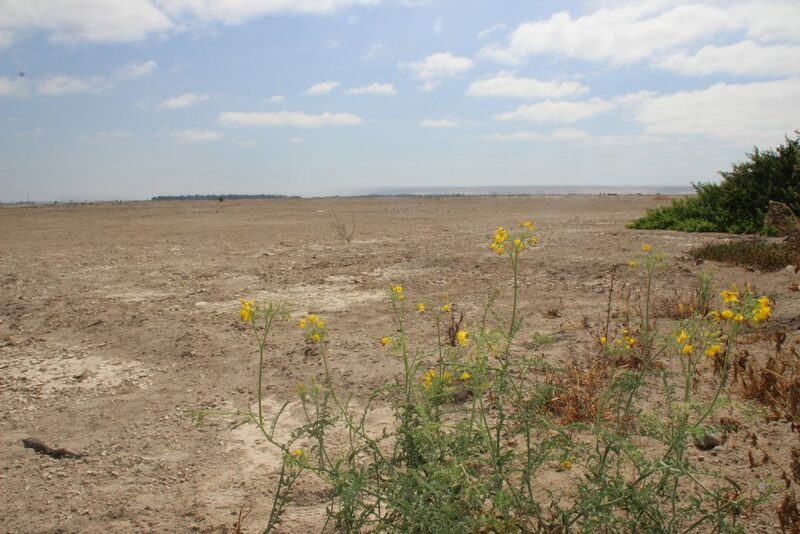 The first part of the road was a weird mix of desert, olive trees and the odd irrigated field with corn. All of this dotted with rubbish and waste. We’ve seen a lot of roadside litter the past weeks, but mostly it was relatively confined to the urban area’s. Today it stretched the full 40 km to the coast. 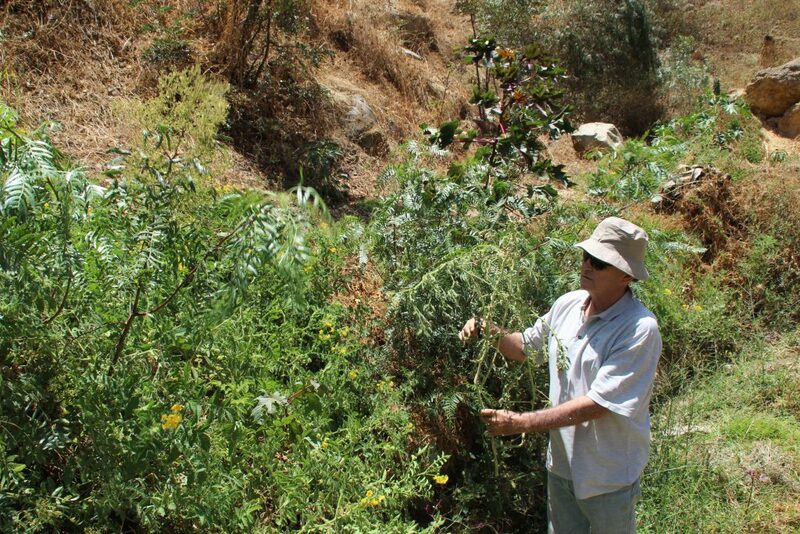 We didn’t expect to see many tomatoes here, but to our big surprise we found one nice plant next to a dry river full of rubbish. This was probably the worst smelling site we visited. I think I stepped on a full diaper when trying to reach the plant, but I’ll spare you the details and only show the picture of the nice side. After this we continued our way to the coast and once there drove for another 25 kilometers north. This is where the mountains reached the coastline, so the habitat would be perfect. This was also the place of the single recorded sighting done in the 1980s. The coastline is very rugged and made for some beautiful views. 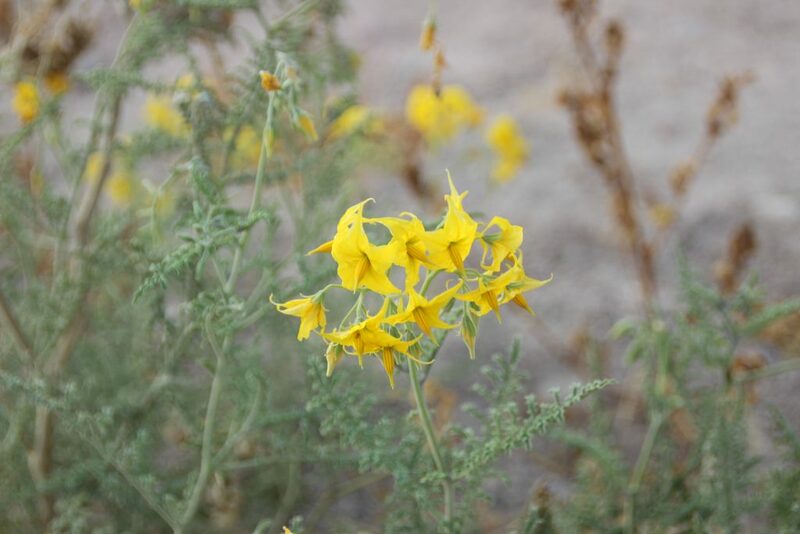 S. peruvianum seems to like it too, because in total we found at least half a dozen plants not far from the road. To finish our day we went down in the next coastal valley and there we found some pretty interesting sites as well. We found wild tomatoes growing in some very different environments, all close to farm land. Some were still on relatively dry soil, but others grew in grassy fields. Very different from what we had seen before. All around us there were plantations. Mainly chili pepper. Phytopthora infestans doesn’t infect chili, but there is a close relative, Phytophthora capsici that does. The chili fields looked pretty clean though. They were obviously sprayed, but I still found a few leaves with infection symptoms. It would be interesting to see if these samples match the spots we found on our wild tomato growing right next to the field. 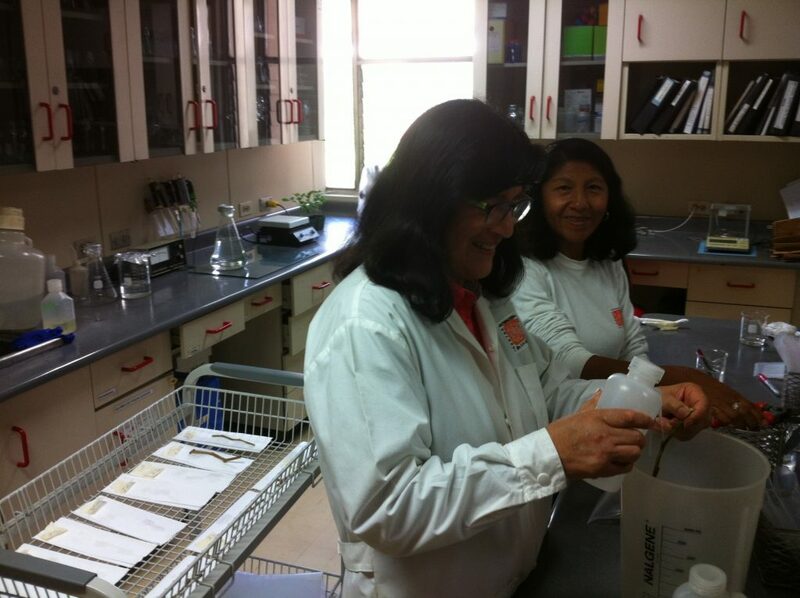 We were back in Tacna in time for a late lunch and spent the afternoon processing our samples again in the hotel room. This was the last day of collecting. This trip we really tried to reach the maximum number of sites, so we could collect only a few samples per site, because the traveling between sites takes very long. 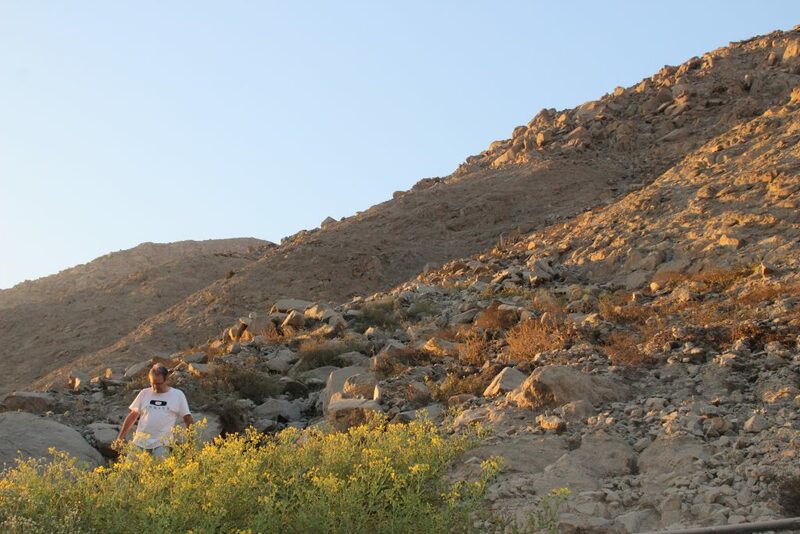 However, in total we have still samples of over 160 different plants, covering 5 species from 45 different locations. Definitely not a bad score. So to celebrate we were headed for one of the better restaurants in Tacna, where they served us some excellent Alpaca meat. After that we went for one last drink. 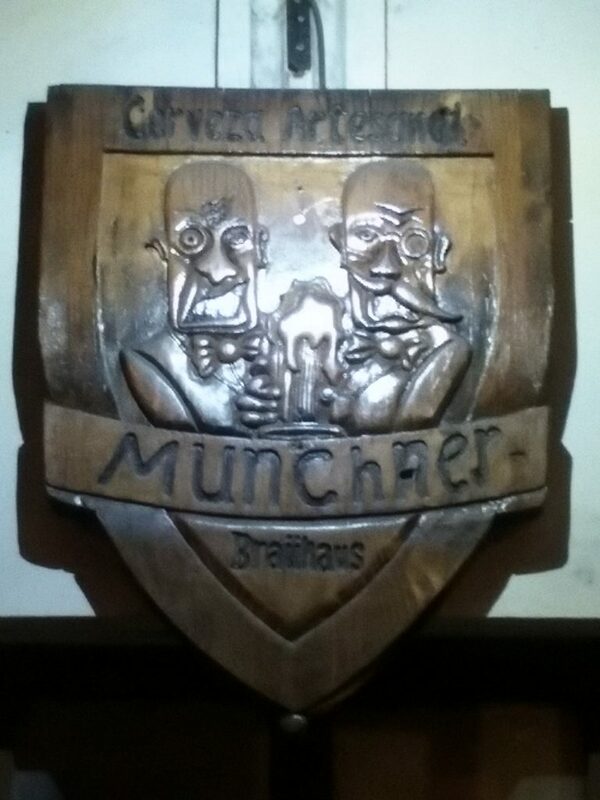 The name of the bar where we ended up, clearly signals that for me it is time to go back home. Today started not much different from yesterday. That said, Moquegua is much nicer in morning rush hour than Arequipa, but as soon as we left the city we hit the desert. Everything was flat and sandy again for miles and miles. Like yesterday, the almost straight Panamerica Sur motorway only made a couple of turns when we were nearing one of the two rivers that had to be crossed. 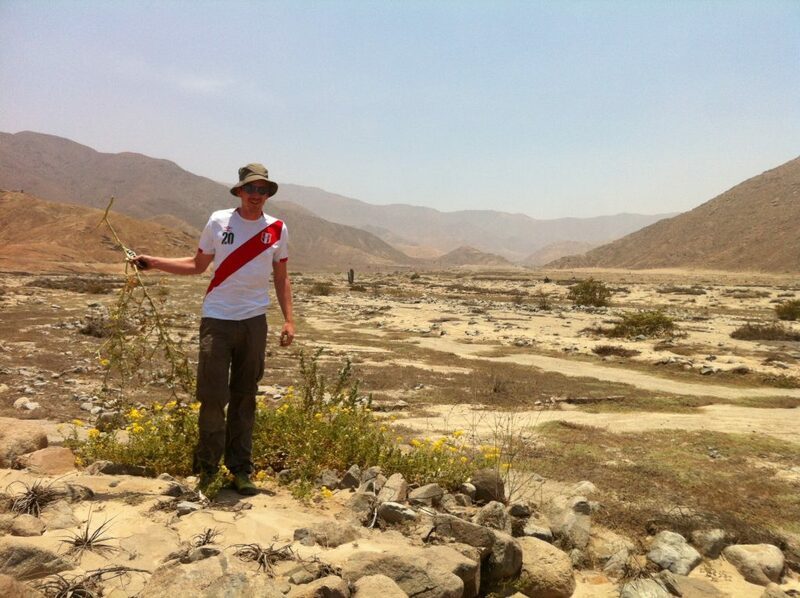 After about 1,5 hour, we made it to the 3rd river and the city of Tacna. From here we went back in the mountains. 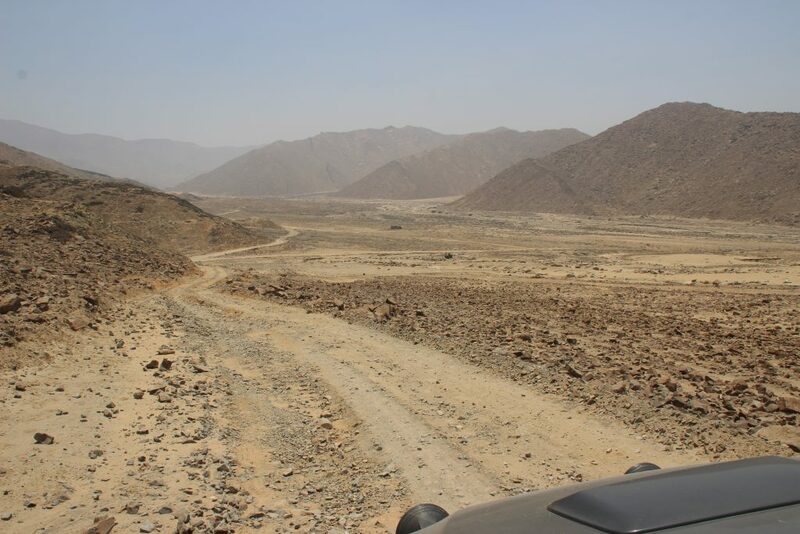 Just like yesterday, the first 20 kilometers were still too low and too sandy, but as soon as we gained elevation and the rocky riverbed came closer to the road, S chilense appeared as well. We drove up to 3500 m and then went down on the other site. What we saw there was quite unexpected. 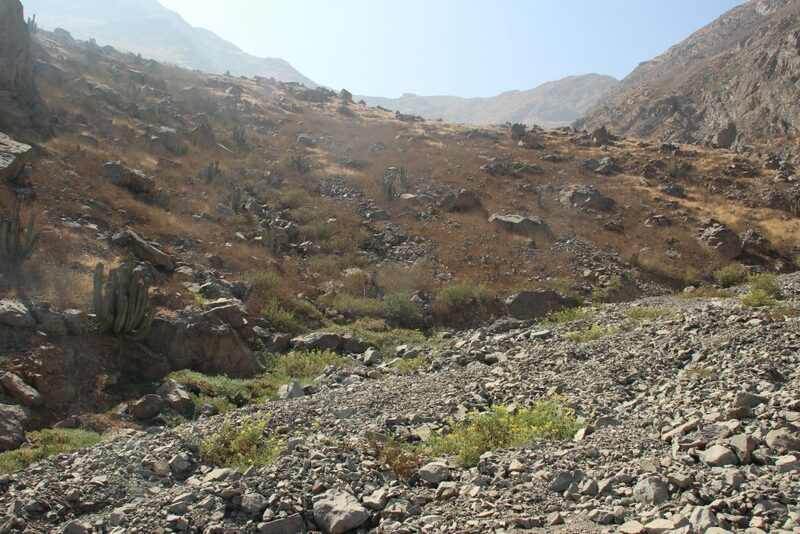 After so many day with mainly sand,we were suddenly looking into a valley where many parts were green. 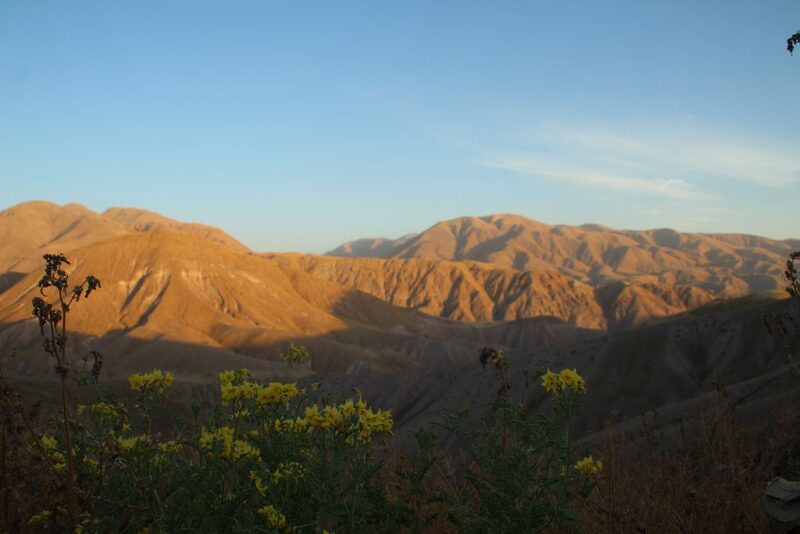 We decided not to sample at all on the way up, but to drive for another two hours from Tacna to a town called Tarata. (To keep things simple, yesterdays furthert point was a town called Torata). Together with Aurelien Tellier and other collaborators, I have worked on the creation of a reference genome for S. chilense. 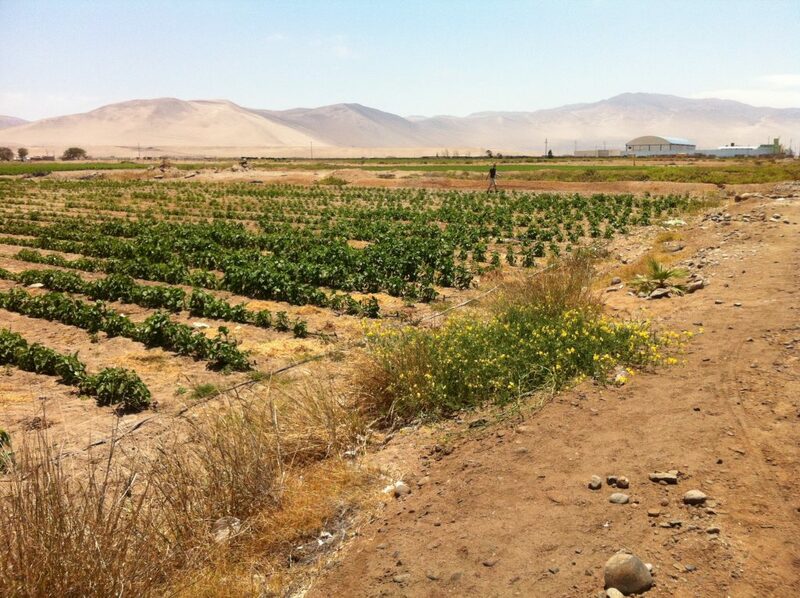 The sequenced plant came from a population with number LA3111 and this population grows on the outskirts of Tacna. However, shortly before we reached Tarata, I realised that our fancy 4×4 had drunk a bit more Diesel on the way up than anticipated. 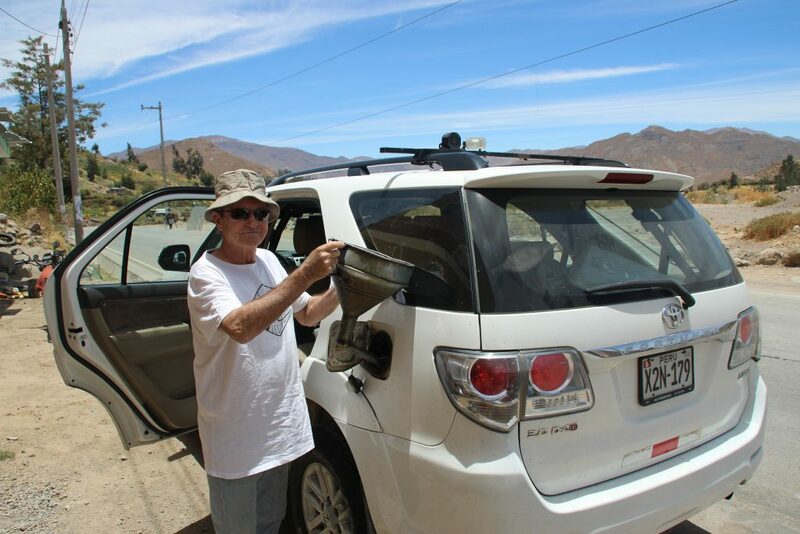 Or differently said, if we continued like this, we would probably not get back to Tacna with this tank of fuel. 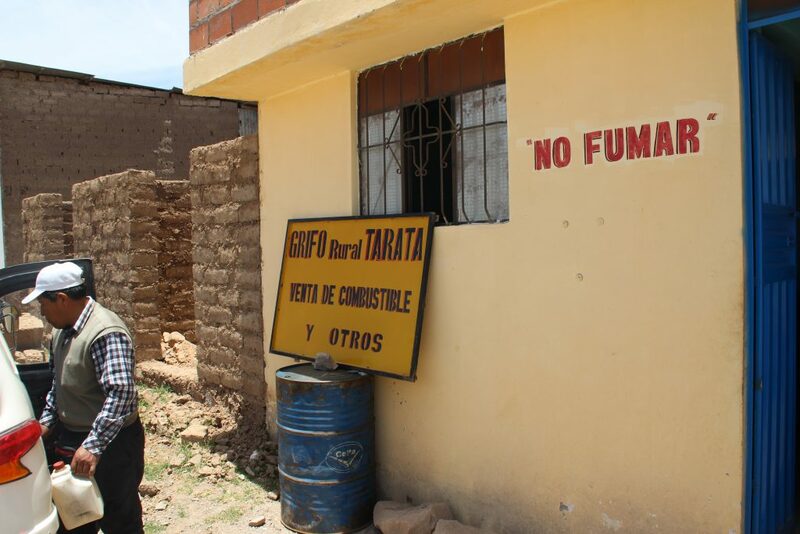 Our good hope of finding a petrol station in Tarata vanished when we saw how small the village was. To be sure, we asked a police officer and he pointed out that we just passed a Rural Petrol Station. We backed up and realised that indeed the sign was clearly there. Inside we found a couple of barrels with either Diesel or Petrol and a small lady who would happily sell us half a bucket of the first one. We could borrow her funnel to make sure everything ended up in the petrol tank. With some extra fuel, we drove on and it did not take long until we found a site, or basically two sites that were both equidistant from the estimated coordinates for LA3111. Based on the description, we decided that it must have been the site closest to town. 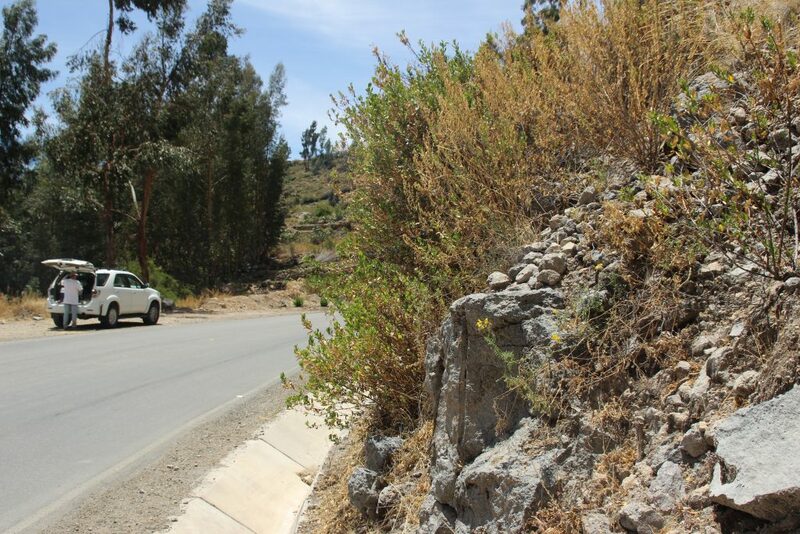 About 5 plants were growing on the left side of the road on the slope overlooking the town and a few others preferred to rocks on the right side of the road. So behold: below the origin of the plant that provided the S chilense reference genome. 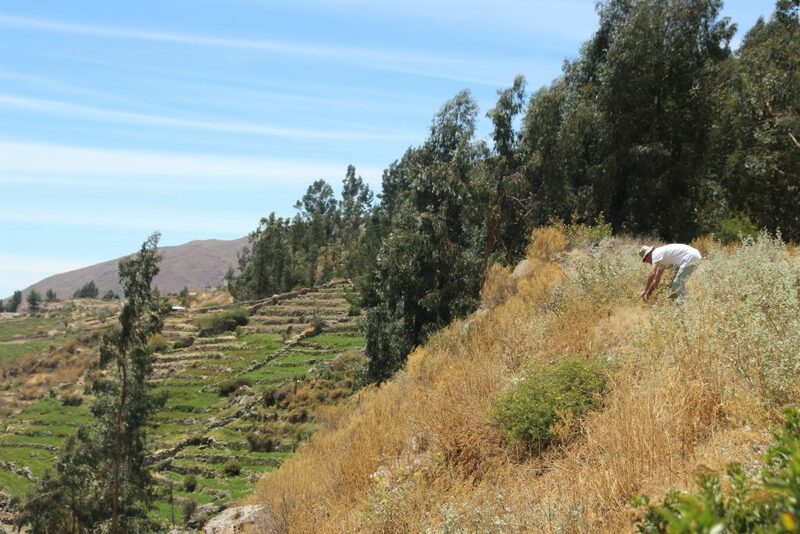 After this highlight, we drove a bit further and found that even at 3050 m the Peruvian love their potatoes. A neat little potato field was not far away from this site and on our way down we would realise that there were a few other potato fields not far from (or even very close to) some S. chilense plants. The potatoes appeared to have been sprayed, but there were also some symptoms of late blight visible, thus indicating that it is in the area and can grow well. 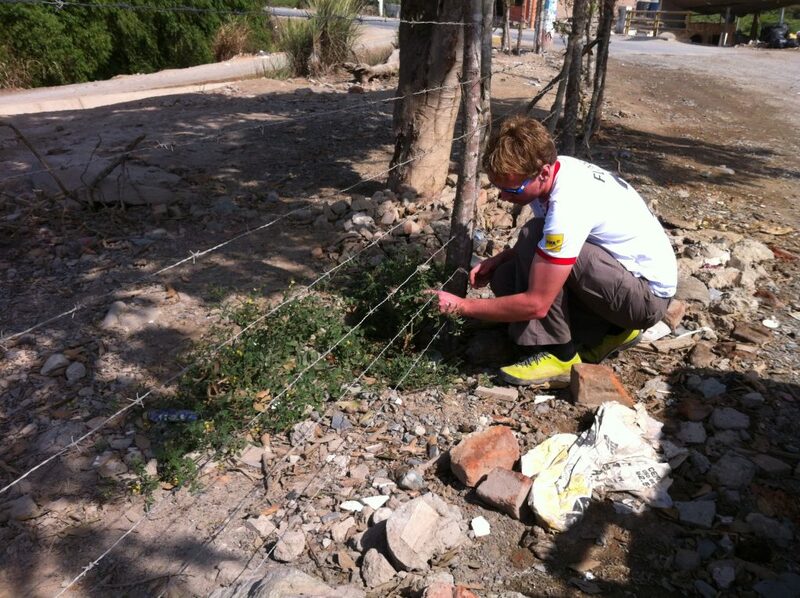 On the way back we made a lot of stops and collected as many samples as we could to process back in our hotel in Tacna. I am now debating whether we will change the plan for tomorrow. The original plan was to drive up in another valley to find more S. chilense, but we have a lot of mountain samples and we could also try our luck on the coast. There are no recorded S. chilense specimens on any of the databases, but they could grow there as well. Luckily I have still the whole night to think about this. After a fairly relaxing day in beautiful Arequipa, we went further southwards today. In this area we will be able to find three species. The most dominant one will be S. chilense, but we could also encounter S Peruvianum and S. Corneriomullerrii. The general area is extremely, and that means extremely dry. But There are a lot of valley were rivers flow all year round or in certain seasons. Besides that, the area experiences a lot of very heavy fog. 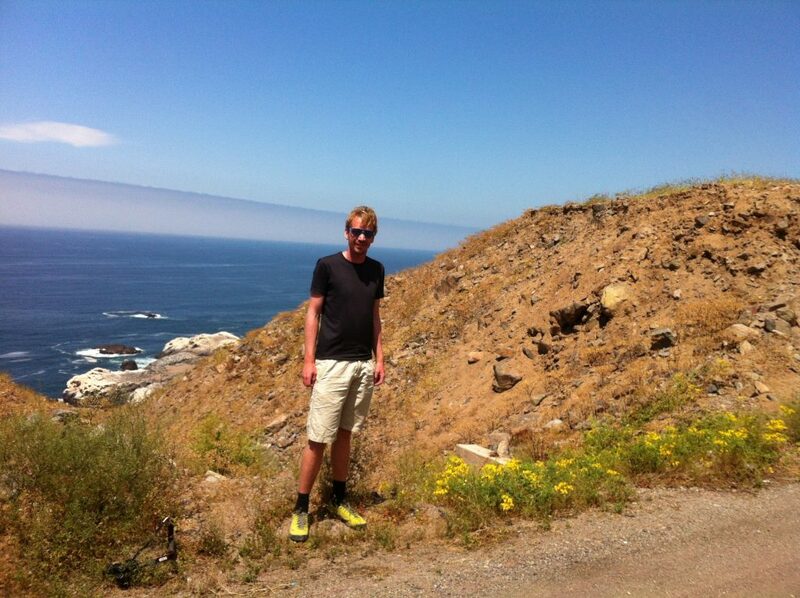 We experienced such fog already on our first trip from Lima. This fog is so dense that in the car you will have to turn on your windscreen wipers. It looks like you drive through a light drizzle. This of course creates perfect infection conditions. For the next week, we got a different car. Driving will probably a bit more comfortable, but we don’t have the nice working space in the back anymore. From Arequipa we drove to the coast. Not far outside the city we started to see the first plants. 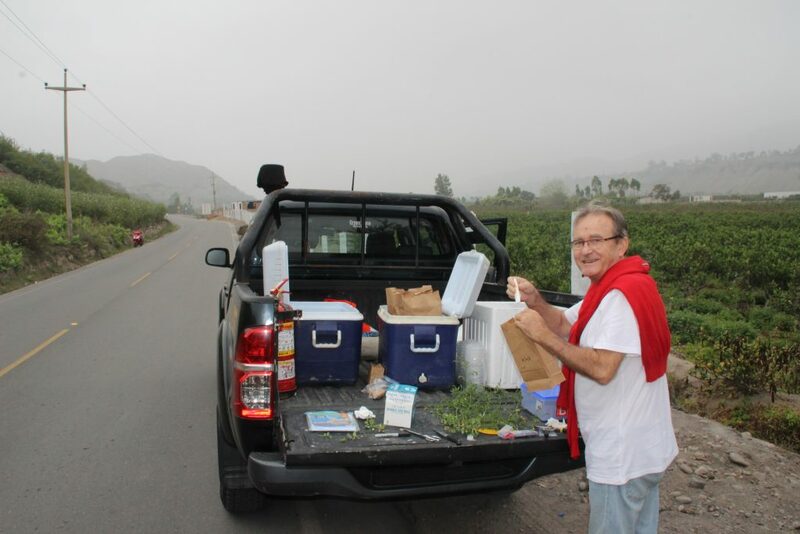 Unfortunately, we were right in morning traffic and driving on a main road (connecting the Peruvian coast with Brasil), so we had to skip a lot of samples, because we just could not stop. We knew we would get some others later and on next trips we can definitely find a way to collect here as well. When the road got a bit quieter, unfortunately, the landscape also got flatter and more importantly, it got drier, so the frequency of plants along the road decreased from one every several hundered meters to basically none for about 50 km. 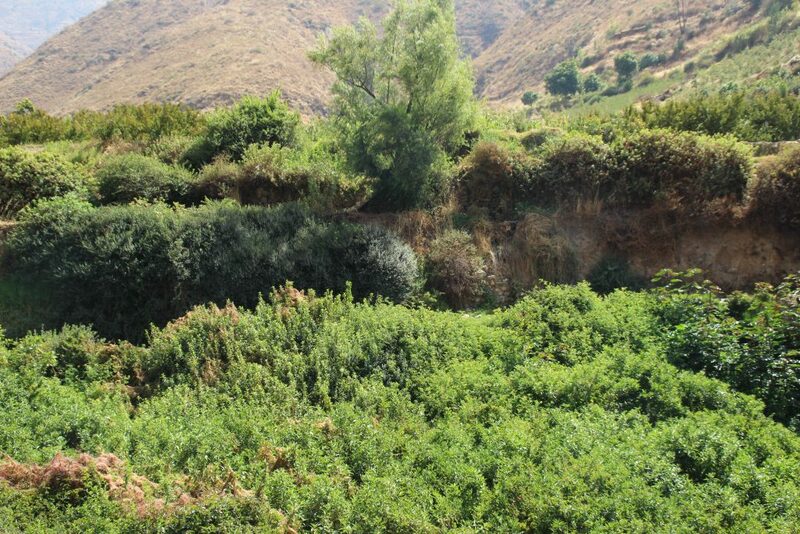 But as soon as the hills came back and there were signs of riverbeds, the first plants reappeared. 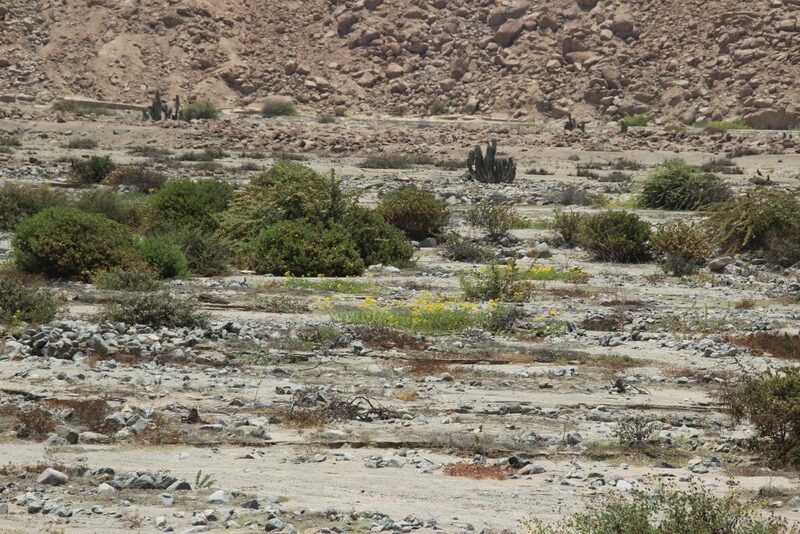 It is incredible to see how these plants look so healthy in such dry regions. But, like I said before. Mist is a thing here and they really capture the humidity. 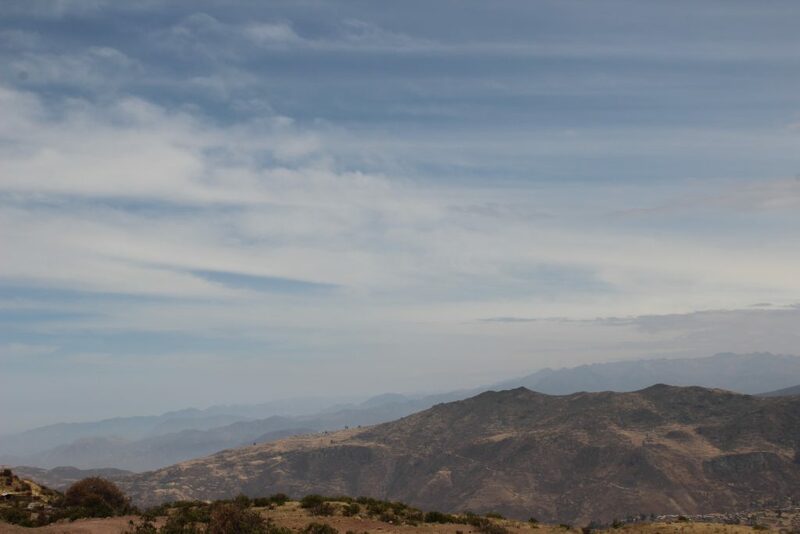 The warning signs for the “Zona Neblina” were everywhere and we saw several net installations that are used to capture water from the air to drink or for agriculture. From this point, I think we saw well over a thousand plants scattered along the roads. Sometimes single individuals, sometimes large groups of plants. Very interesting to see. The dry landscape was sometimes interrupted by some very lush fields and even grazing cows, but this was of course only very close to the rivers. Overall, the landscape was rugged and beautiful. Some tomatoes seemed to look completely healthy, not a single brown lesion, whereas others had some sign of infection. In many cases, there was also considerable drought stress, so some leaves would start to turn brown. Unfortunately, this browning can look very similar to infection symptoms, so picking the right plants took a bit longer than we expected. The views made up for it though. The evening we spent in Moquegua. a quiet medium sized town in a fairly green valley. 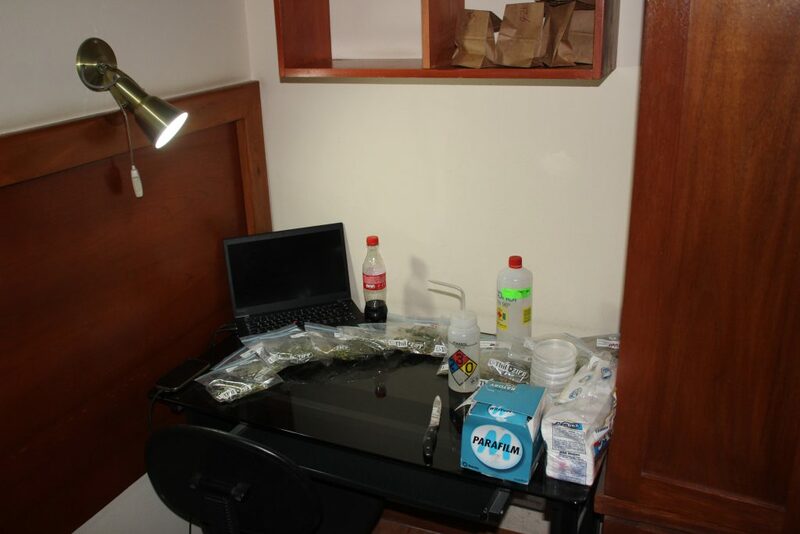 Unfortunately I didn’t have much time to see a lot of the town, because during the day, we did not manage to find a space to process the samples, so I had to set up a hotel room lab. Then again processing infected wild tomato samples is strangely gratifying. Yesterday we had a break from the field work. It was still a pretty busy day. Working days at CIP start early and both Philippe and I wanted to have a look in the labs and see some of the first results. After breakfast we started with a seminar, Jean Ristaino talked about her work on global P. infestans diversity, which was very interesting. After the seminar, I could have a quick look in the lab, where two of the technicians could show me the plates with the results from our first day collecting. One of the reasons for this trip was to figure out what the best sampling methods are. We can take the infected leaves and put them in a petri dish with some water agar to keep them humid, so that they don’t dry out, but carrying loads of plates is not easy and in the lab, you can get any kind of growth on these plates, the pathogen that you want, but also opportunists that make it harder to isolate the real infecting pathogen Moreover, plates get contaminated when not store properly and I had already thrown away some plates the previous days. Alternative methods include using sliced potatoes. You can store leaves in between two slices and keep it for a few days. The idea is that the potato then gets infected and that after you are back in the lab you can grow Phytophthora on the potato and isolate it later. This is supposed to be cleaner and the potatoes are easier to carry and obtain, but we don’t know if it works with at all Phytophthora strains that grow on wild tomatoes. They might not be adapted to growing on a potato. Another issue might be being away from a temperature controlled lab for 3 days. That might stress the sample so that we cannot recover anything. Unfortunately, both methods take mostly more than 5 days to get proper results. So, so far we have only one P. infestans sample that has already been processed further. That means, the spores of P. infestans had grown, were washed off and reinoculated on fresh, susceptible potato and tomato leaves. The cool thing is, it came from the first plant collected on the first day. Besides that there are a large number of promising candidates from the first three days, but also a back-log of samples that we brought in yesterday. Manpower is limited, but we can store the samples in a cold place for a while and process after the weekend and a lot of boxes with sliced up potatoes are already prepared and filling the lab. At 11, I had a meeting with Tiina Sarkinen. She is an expert on wild Solanum species, including tomato, and it was really interesting to hear her thoughts and to share experiences. Of course, I already knew that there are a lot of interesting wild solanum species, but that there were that many. There is definitely room for a lot more research in this area. For lunch we went to a nice little restaurant on the campus of the nearby national agricultural university La Molina. I don’t say it often, but the portion was way too big. Very tasty though. Anticuchos served with typical Peruvian potato and maize varieties. Tiina had recommended me to take a little walk on the campus after lunch. I’d find some nice things there, and she was right. Next to some of the trial fields, there was a good population of S. pimpinellifolium. Some were clearly suffering from one thing or the other, but other looked beautifully healthy. I collected three specimens of which one is almost certainly infected with Phytophthora. Now that is easy sampling. Philippe has spend part of the day in the lab looking at his own samples. For him this trip is not so much about how to sample and process Ralstonia, he’s been doing it for years. For him it is the question whether there is Ralstonia at all in these environments and in these species. If there is, that might explain more about the evolution of the species. Also he is not alone in the lab. When I returned at the CIP, we had to pack our stuff for the next week. Double checking if we still have all that we needed. From pens to plastic bags, but also letters that explain what we do, so that we don’t get in trouble with the police. We had to hand back the truck we rented and sort the paperwork for the car rental and all other things we do next week. As one would expect, these things take forever, so by the time this was all done, we had to get ready to go for dinner. Dinner was at a house warming party of some people working at CIP. We felt very welcome in the CIP family and it was very nice to talk to all people there and to hear about the different research going at the institute. Today, I will make the planning for the rest of the stay here and I also hope to have a quick look in the lab in the morning, if someone can let me in. The afternoon will be used to work away all unanswered emails and other things from the past few days. Late afternoon we fly to Arequipa for the last leg of this trip. I am really looking forward to that. 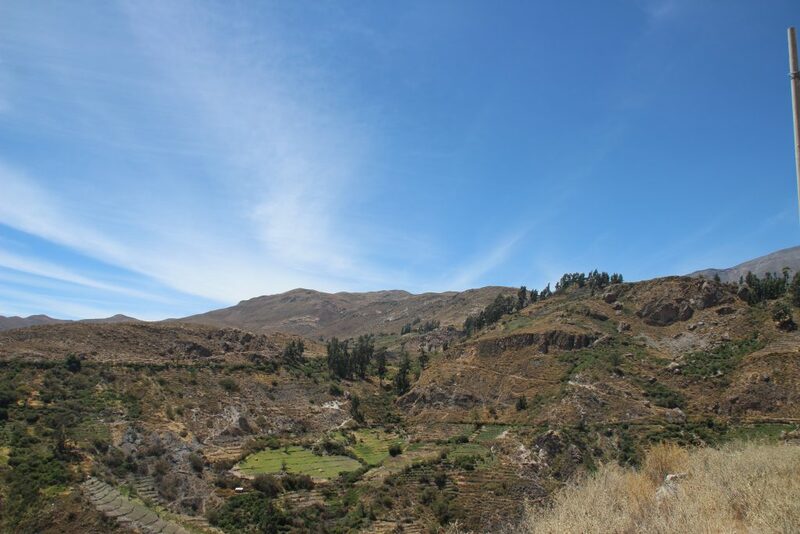 This is the area where S. peruvianum and S. chilense grow. S. chilense are the plants that I have worked with in Freising for the last 2 years. I must also say, it is very exciting and rewarding to do this work, but also really tiring. So, before we hit the road on Monday again, we will use the Sunday to relax in Arequipa and be tourist for one day! The day started of pretty nice again. Ok, the hotel didn’t serve breakfast, but one block away we found a bakery like shop that served us a decent empenada and had some very upbeat music just loud enough that it wouldn’t make sense to talk to each other. This, of course made for a very happy the start of the day. After breakfast we left Huaral with a minor detour, but this led us to the first surprise of the day. Urban wild tomatoes! A nice S. pimpinellifolium was growing next to a pile of rubbish well within the city and a second one could be found in a field, behind a pretty decent barbed-wire fence. Today was supposed to be a shorter day. 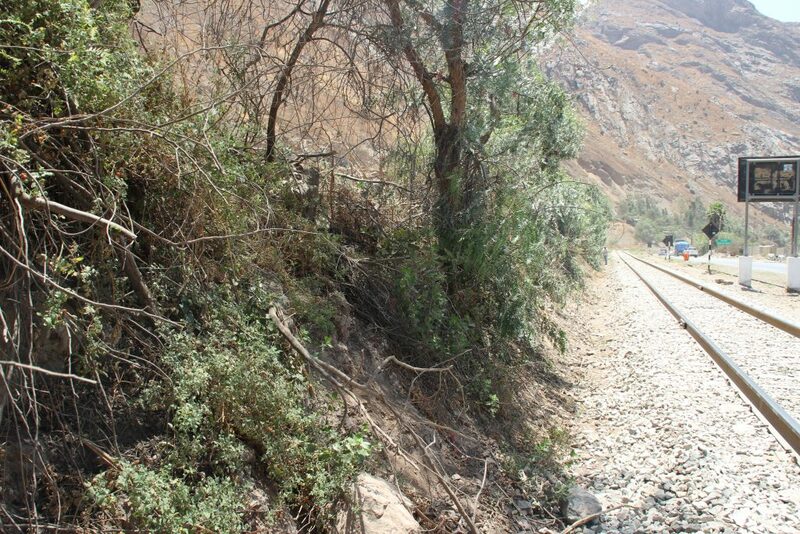 From Huaral to Lima are 90 km. When you take the Panamerican highway, this can be done in under 2 hours, even with dense traffic. We took the B-road, the 108. Google tells you that when you follow this road, it will take you three hours. However, Google is pretty much completely off when it comes to dirt tracks. We learned this the past few days so, we do our own calculations. On average, I can drive about 25 – 30 km/h on the track. This includes the occasional stop to look for the plants. So the we add a few hours of actual sampling and you can calculate that no more than 6 hours after leaving we’d be in Lima. Today’s road was slightly different. First of all it was very impressive, sometimes green and agriculture all around, then dry and pretty dusty, but above all it pot holed like no other. So badly, that I regularly had to use the lowest of the low gears to just get over the road. Below a picture of a good section. After seeing this mixed landscape for a while and encountering the odd S. pimpinellifolium and S. pennellii the landscape change again. Everything became even dryer and dustier. A total moon landscape right ahead of us. So we feared, looking at the distance to go, that the next 5 hours would be tomato free. This turned out to be completely false. After a few km, we came closer to the dried up river beds and suddenly the S. pennellii popped up all over the place. I think that I am not exaggerating if I say that on some locations you could see plants every 20 meters for hundreds of meters. Truly amazing. 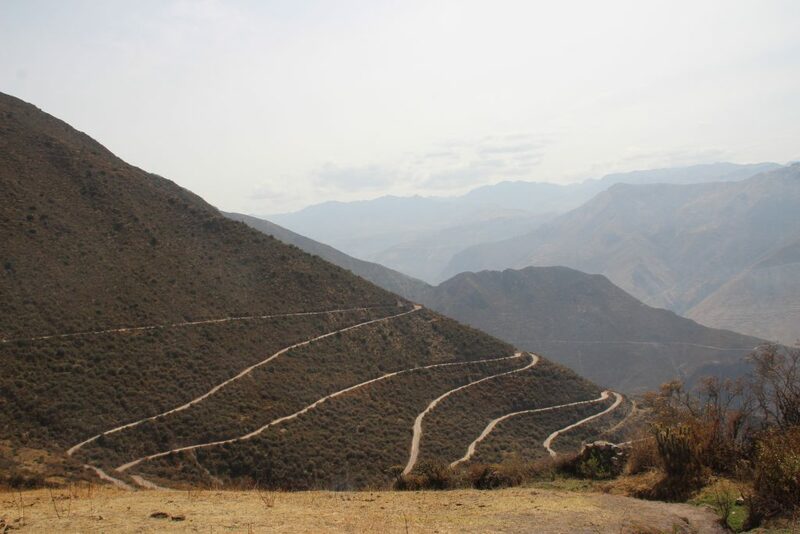 After 25 km, the road went up in the mountains again, but the tomato intensity did not decrease. The species changed to S. peruvianum and all along the road there were hundred of plants On the way down on the other side, the gradually made way to S. pennellii again, just like on the other side. Hundreds of plants, all in a place dry as the moon. Interestingly, if you put your hand in between the leaves of the plant to sample the lower parts, you can feel humitity on your skin. Between the leaves of the tomatoes is a true humid microenvironment! Today is probably the day with the most spotted plants, which came to me totally unexpected. 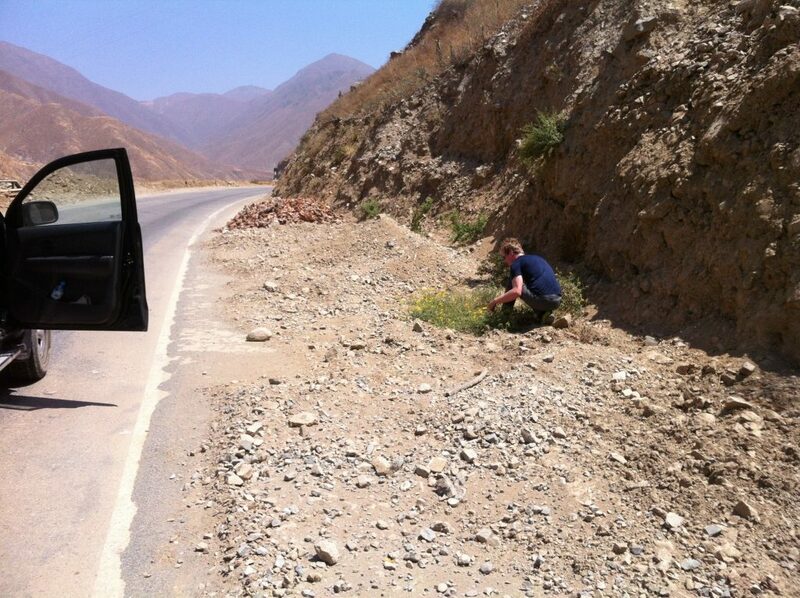 However, since it also came with as many pot holes, we finally arrived in Lima at a bit past 16:00. Both Philippe and I are not CIP employees, so we would have needed a special permit to work after 17:00. This left not much time to fully prepare the samples, so we decided quickly prep everything for overnight storage and tomorrow we will join the CIP technicians with the sample preps. I am really looking forward to this, because upon my arrival, they told me that they isolated some P infestans spores from the 1st sample, collected on the 1st day. Let’s see if we can get more! Today we planned to leave the hotel early again. And, we did. We left 30 minutes later than the plan was due to issues with my bank card, but overall, it was fine. 6:30 am, we were on the road. 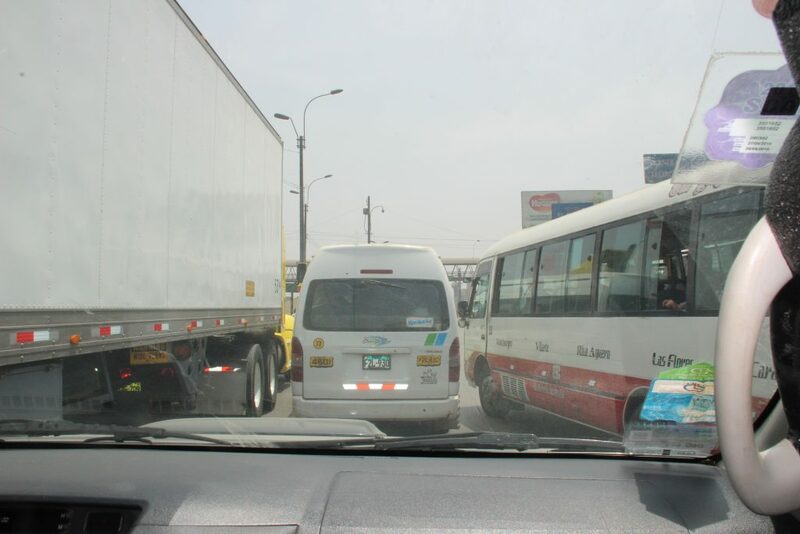 Traffic in Lima didn’t slow us down as much as other yesterday. By 9:00 we had left the city and we had a break for a proper breakfast in a town of which I cannot remember the name. 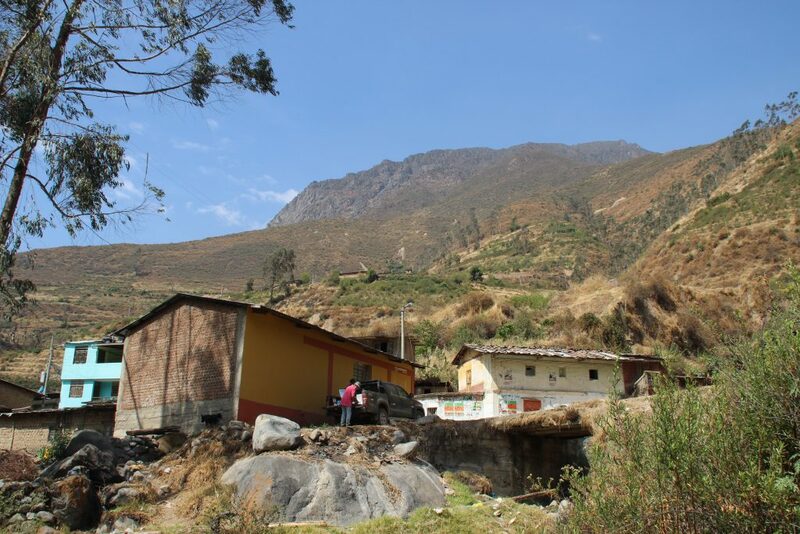 Shortly after this town the landscape changed dramatically, from dry Lima-suburban-slums, we suddenly found ourselves in a lush and agriculture rich area. No wild tomatoes though. So, we drove on. 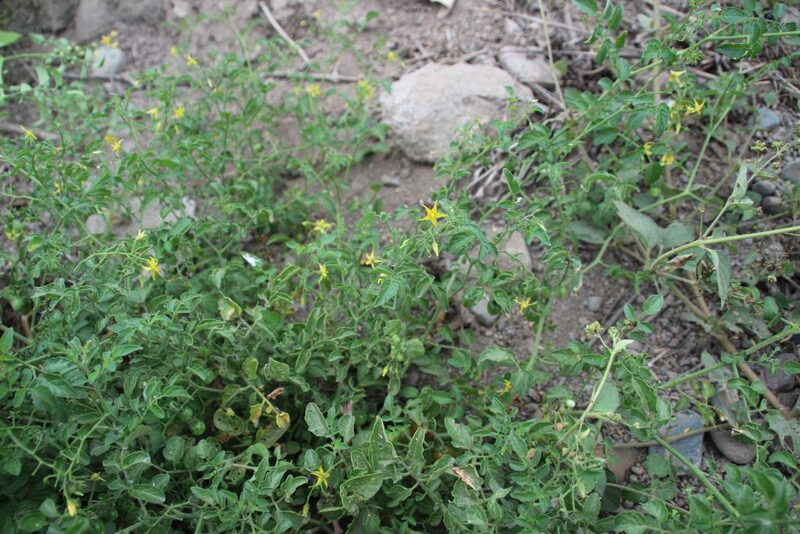 The road followed the river up into the mountains and by the time we reached 800 m altitude, the first wild tomatoes appeared, S. pimpinellifulium again. Today we were totally professional and all efficient, so we picked the plants, but did not process the samples immediately. We would collect a few sites and do all in batches. We found a very good site with dozens of S. pennellii in a bend in the road, going several hundred meters up. Here we collected additional samples and processed the previous ones as well. 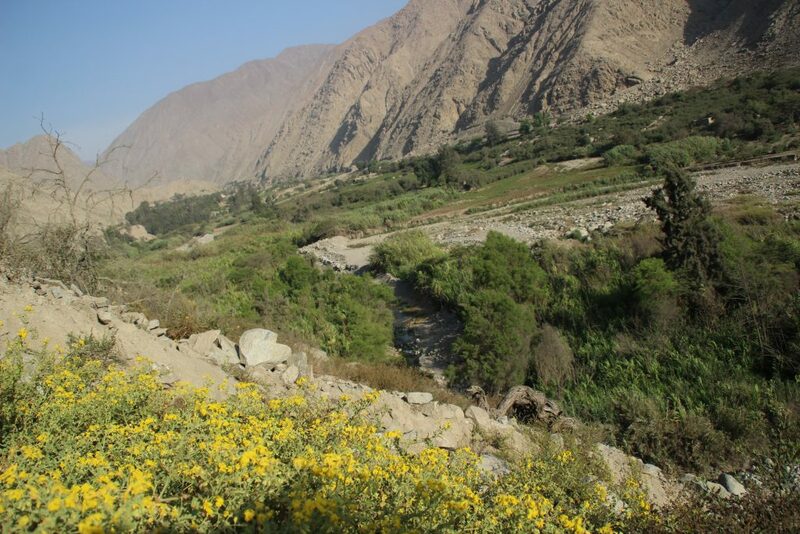 Not far from this site, we also found nice, but lonely S. peruvianum just on the side of the road. After this plant we drove for quite a while. The occasional S. pennellii plant popped up, but we wanted to sample from a big population, so we could pick the best looking symptoms. I was just about to give up on finding one and wanted to suggest sampling a couple of these lonely plants next to the road, when Philippe yelled “Stop, stop, go back, go back”. I must have been looking tired or stupid, because he repeated himself a few more times. This, however, was a good thing, because after I reversed the car for a few hundred meters Philippe pointed me at the absolutely stunning site that I just overlooked. At least 50 plants growing in a dry river bed. With plenty of S. pennellii in the pocket now, we were ready to drive into S. habrochaites country. The altitude meter told us we were passing 2000m, the area became greener and yes, there they were. Sometimes individually and sometimes in larger populations. We stopped at a site where we also found S. peruvianum and a third species which I think to be S corneliomulleri. I found very few P. infestans like symptoms on the S habrochaites. 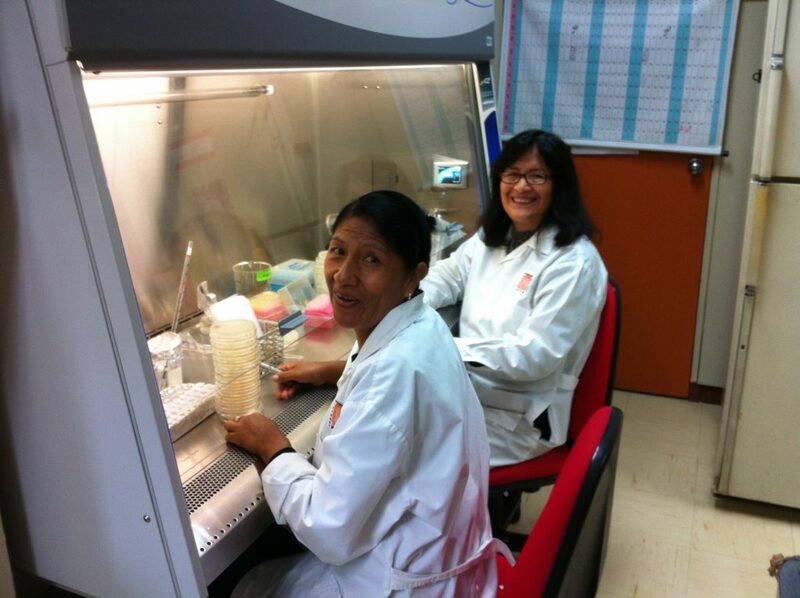 I expected this, because in the lab S. habrochaites is more resistant P. infestans than the other species we tested. Interestingly, there were some beautiful concentric rings with a yellow halo on quite a few leaves, so Alternria spp are probably doing fine on the plant. Next time, we should expand the collection permit. When I was about to head back, I suddenly heard some exciting scream behind me. Philippe had found a plant that showed some very clear and strong wilting symptoms. The hypothesis for this trip was that the bacteria would be mostly asymptomatic in these species, so seeing this is quite exciting. However, we’ll have to wait till we’re back in the lab to know whether it is really bacterial wilt. Early afternoon, we reached Canta. Our preferred hotel was closed, so we had to look for something else. We also still had to prep the samples of the second half of the morning morning. We did this in a hotel recommended by others, but we soon realised that there was no decent wifi connection and the beds were covered in dust. Motivated scientist as we are, that could have been OK, if only had we printed or at all prepared our route for tomorrow, so after sample prep in the dining room of the hotel and after having eaten our lunch there, we decided to move to another hotel. The new hotel was only a few hundred meters away and looked much better. By the time we had checked in and settled down it turned out to be almost 15:00. Because our morning had been pretty successful and we both noticed some tiredness from the previous days, we decided to call it a day. This meant we finally had time to catch up with email and other work and also to just have a bit of a rest. For dinner we found a very typical Peruvian place, so we ordered Deep fried Guinnea Pig and a Pisco Sour at 2892 m above sea level. To not upset the readers of this blog, none of us took a picture of our meal, which wasn’t that tasty, by the way. Tomorrow we’re going “off road” to find more S habrochaites. I’m looking forward to it. Today started with a slightly different speed than yesterday. We had to drop yesterdays samples off at the lab to be cleaned up and we wanted to get some paperwork sorted to avoid issues with the police like yesterday. When we dropped our samples off, we ran into Tiina Sarkinen and Jean Ristaino who were about to leave for sampling themselves. Luckily we had a few minutes to exchange ideas. After this, we were meeting with Albert Salas, the CIP expert in wild tomatoes. He went trough our itinerary and made a few suggestions. Turns out that the plan that I made before, was quite OK. After the meeting we had to wait for the paperwork to be finished and we could be on our way. Then at just past 13:00 we reached our first site and it was a beauty! 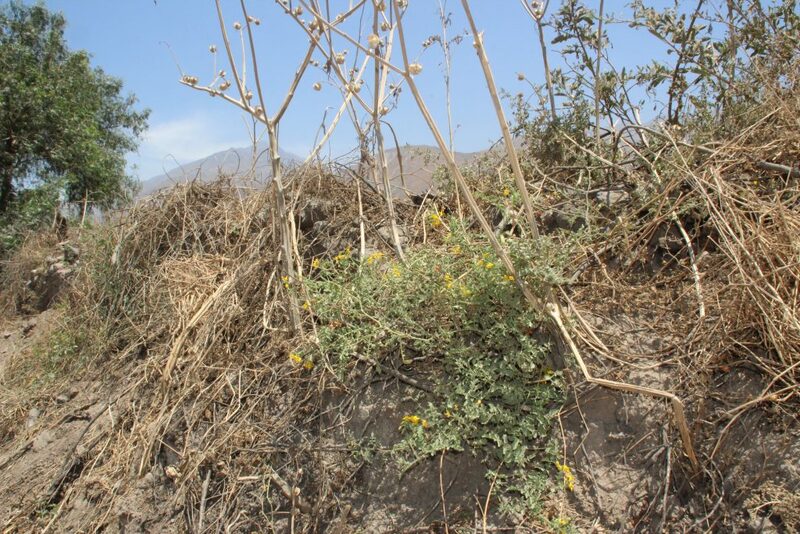 We stopped because I spotted a lonely Solanum peruvianum plant and it turned out that he was surrounded by tiny S. pimpinellifolium plants and a third wild tomato that I could not determine. So, at one site we got three species. It would be very interesting to sample all plants and see how the pathogens on all of them compare, but in this particular project there is no time for that. In order to reach other sites and other species, we have to limit the number of samples we take per site. So, after collecting wilted plant parts and a selection of brown lesions from about 5 plants, we drove on and just after 14:00 we had a nice lunch in the nearest village. The afternoon we drove further into the mountains. 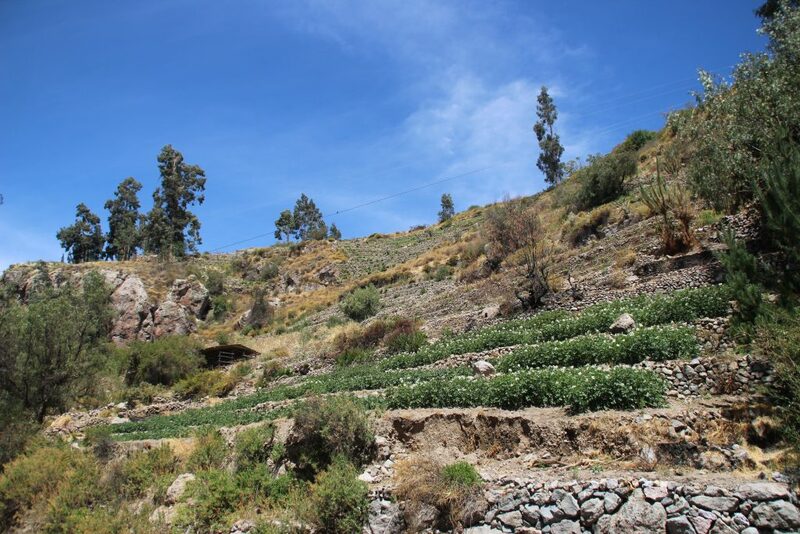 On our way we saw a lot of nice and not so nice S. peruvianum plants. Many of them growing high on very steep slopes. I nearly sprained my ankle when the piece of rock that I trusted to hold me on my way down broke off and I slipped down a dew meters. 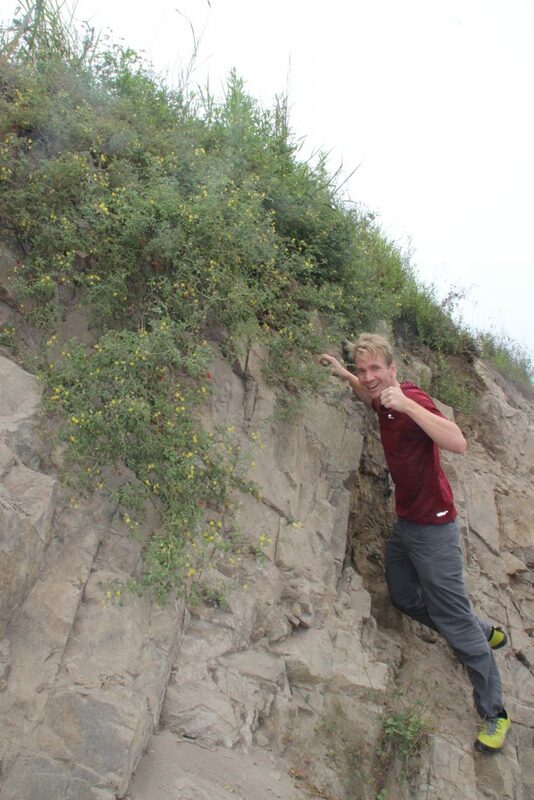 Maybe rock climbing and wild tomatoes should be limited to areas with good solid rock. 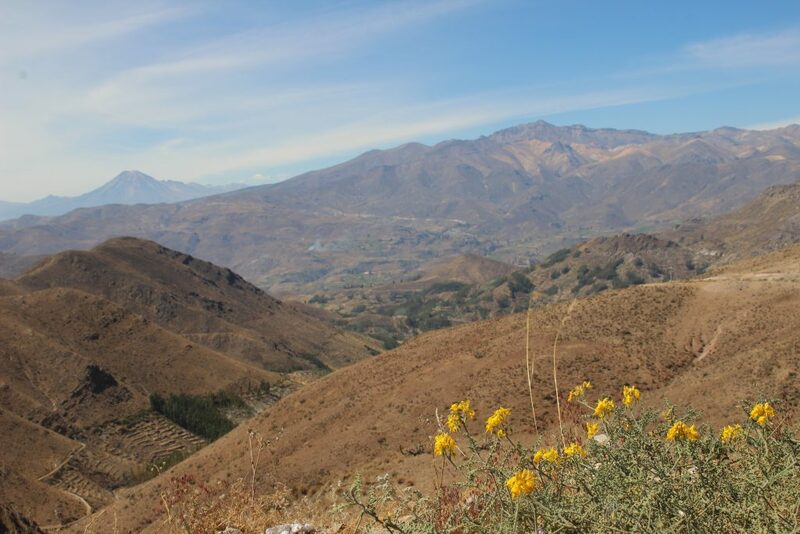 We drove for a good 2 hours with quite a lot of stops to collect S. peruvianum specimens until we realised that we would also have to go back to Lima. So then, we turned around. The way back started of nicely. We found a good spot to prepare the samples and were done doing that rather quickly. Also the first hour of the drive back went way smoother than we planned. But then Lima traffic hell broke upon us again. 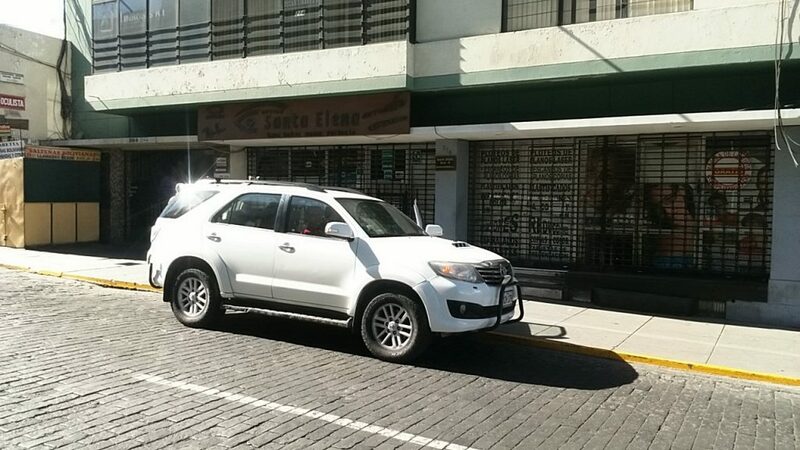 I can’t really find the words to describe what it is to drive in Lima, but i like to think that reversing the Middle ring in Munich while blindfolded is a similar experience. You’re barely moving and have no clue what goes on around you. After four near hits, one truck hit the side of our car. Luckily nothing major, but both Philipe (who had been swearing and yelling of amazement by the drivers surrounding us) and me (who had been swearing and yelling of anger at the drivers surrounding us) decided that this was another good reason to change our plan. Tomorrow we are not going to do a round trip. We drive out further a field, to spend the night there and come back via a different route the day after. So, tomorrow we’ll sleep in a village of 2000 inhabitants at 2837 m altitude. I’m sure the traffic will be lighter. What a day! It all started perfect. Being properly jetlagged, Philippe and I managed to leave our hotel fully packed by 6am. We were well outside Lima by 7 and made our way southwards on towards the toll gates of the Motorway 1, Panamerica Sur towards Mala. Lima police apparently don’t have much to do on Sunday mornings, so they stopped each car after the toll gates, including ours. This is great when you don’t really speak Spanish and the Police no English at all. As a model citizen I handed over my driving licence and the three pieces of the cars paperwork. The policeman looked once, twice, three times and then suddenly asked something that I really could not get. After some repetitions, I think he asked what we were transporting or for whom we were working. Turns out our car is registered as a cargo vehicle and apparently, you need a special license for that. Luckily the policeman appeared in a good mood, or was just treally fed up with my horrible Spanish, because after a few times of me trying to explain what we were going, and how amazing wild tomatoes are, he suddenly said that everything was fine. In Mala we had a pretty heavy breakfast before we made our way into the Lomas de Condestable. 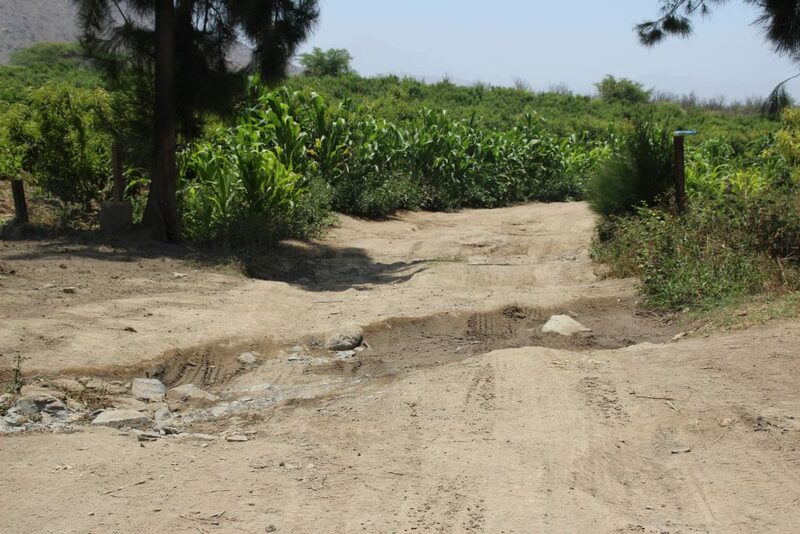 The landscape looked dry, but not as dry as along hte road to Mala and the tgrc told us that once in 1974, someone collected Solanum pimpinellifolium there. So off we went. Unfortunately, nothing was to be found at the described site, so we drove on a bit. Then, the coffee from breakfast really had to leave my body, so we took a break and lo and behold, there it was: our first wild tomato of the day! Right next to us. And even better, it showed a beautiful mix of infected leaves and healthy leaves and a bit even showed wilting symptoms. 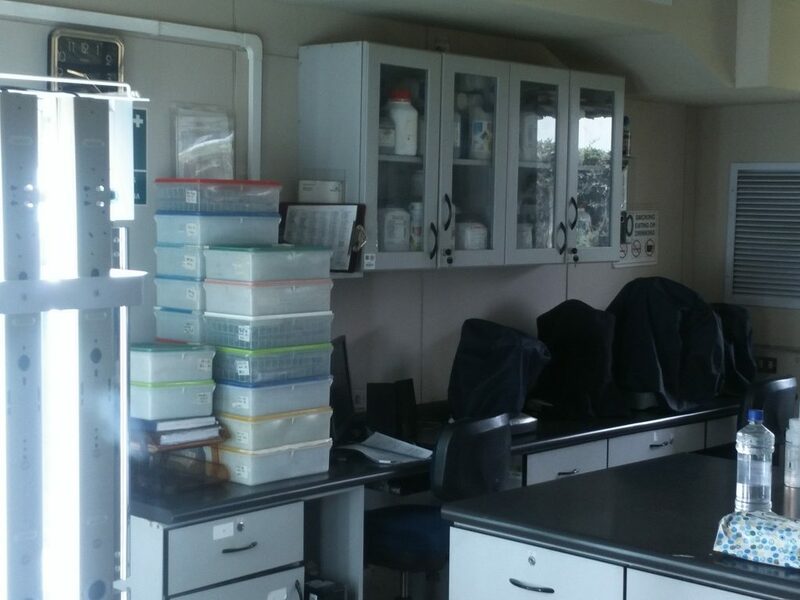 Closeby, we found several other interesting specimens, so it was really time to put our mobile lab in action. 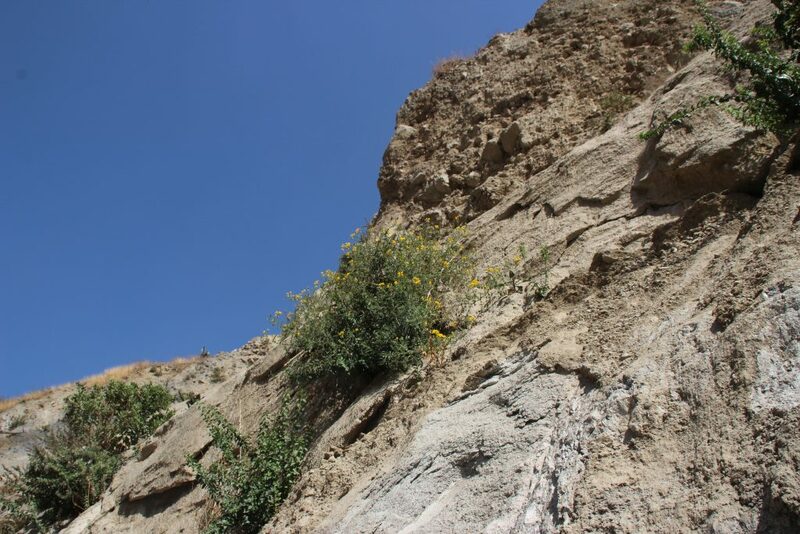 Further up in the valley, it became even more exciting and I had to combine two of my favourite things, wild tomatoes and rock climbing, because there was a beautiful specimen of S. pimpinellifolium hanging high on the rocks. Further in the valley were a lot more plants, so this was really a good start. 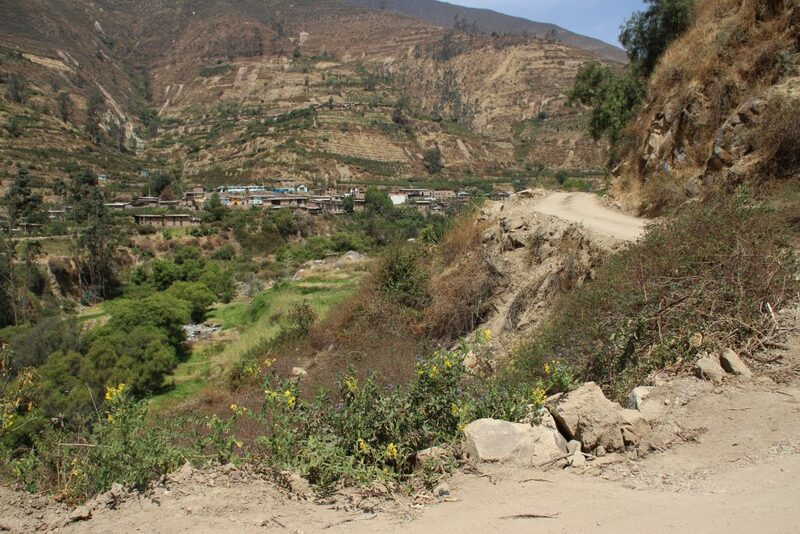 For the afternoon we headed back towards Lima and head north-east from a town called Lurin towards Cieneguilla. On our way we should spot 6 or 7 more populations. However, this turned to be not quite the case. 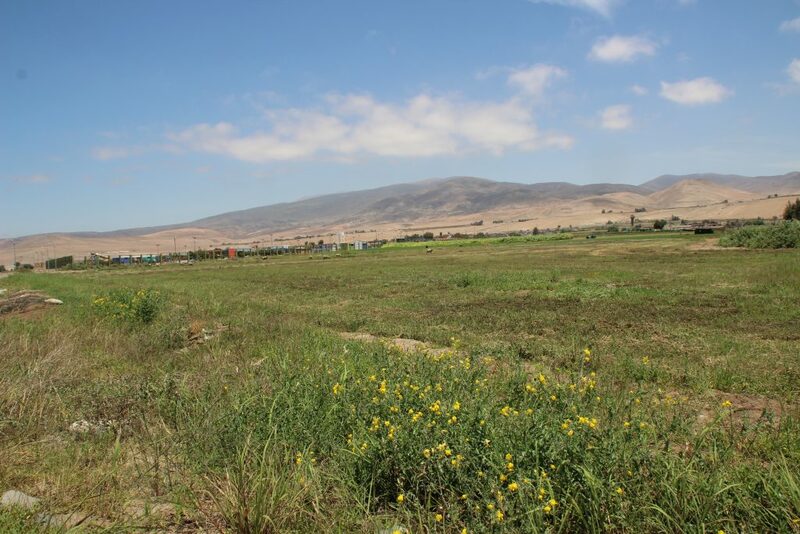 Greater Lima spralws like no other and we found road, parking lots and homes where our plants were supposed to be. Heavy gates blocked to view to what were supposed to be meadows. Not good. So, after a successful early morning, we were again quite devastated by the time we sat down for lunch. Then again, it was not so bad that a good serving of Ceviche couldn’t cure it. After lunch we followed the road 112 towards Sisicaya. Here we passed a field with cultivated tomato, which we decided to sample, just for the sake of it when we saw, on the other side of the road, on the edge of a chili plantation, our first S. pennellii. A bit further down the road the amount of plants slowly increased until suddenly, we were surrounded by a huge S. pennellii population. 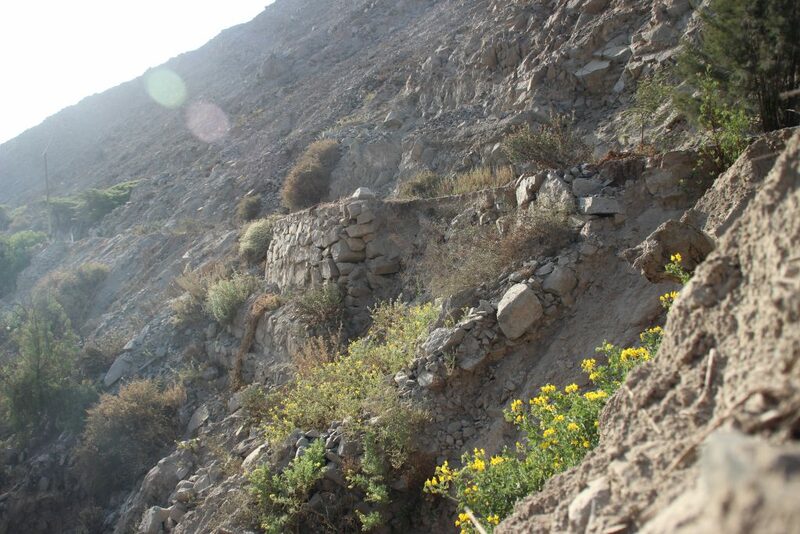 Over a hundred plants grew on the steep slopes on both sides of the road. Many totally healthy, but again some showed some disease symptoms. Between the hundreds of S. pennellii, we could also identify some lost S. pimpinellifolium, however these all seemed to suffer from drought and were more brown than green. We drove around a bit further and founds quite a lot of individual plants along the roadsite, but no big populations like before. We samples some of them and we decided to call it a day. Then on the way back we saw what might be the biggest tomato plant on the planet. 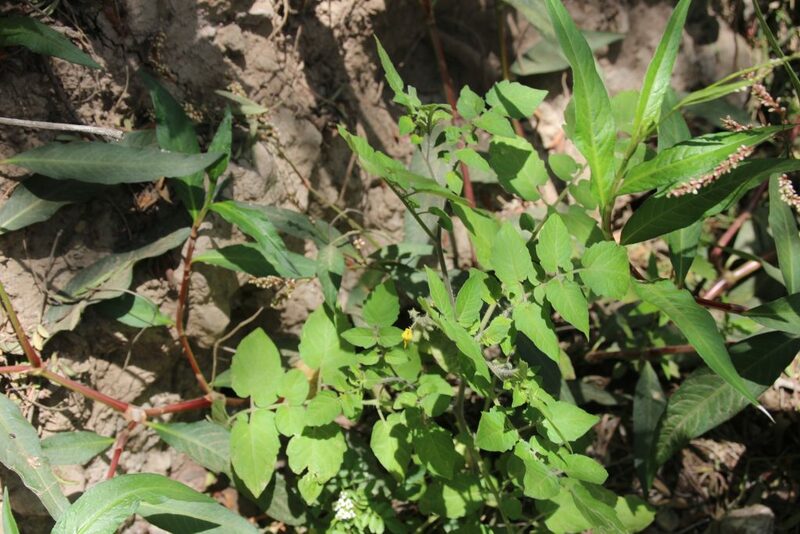 The thing on the picture below is one plant. The branches were often over 5 meter long and the base of the stem was about 8 cm thick! It looked very healthy, but had some interesting Phytophthora like lesions. Back back in the hotel fell almost straight a sleep. What a start!